My Summary: Luna is stuck picking up the pieces of the shattered life Chance left her with. While she plans for the birth of her son Maero, secrets of Chance's past are being revealed. What will she do once she learns the truth of who Chance really was, of the human hiding behind the mask of a psychopath? Find out in the third installment of the Rituals of the Night by Kayla Krantz. My Rating: Oh, my goodness. The ending left me with a mix of emotions as I am still trying to understand and sympathize with what both Luna and Chance were feeling. Survive at Midnight is much darker than the previous books in the series, and Kayla Krantz manages to surprise us yet again, leaving us dumbfounded as the events play out on the pages before us. All I know now, is I need to find out what happens next. This is a completely original story. I can guarantee you will not find another quite like the story of Chance and Luna. I am eagerly awaiting the next installment where I hope we get to explore even more of DreamWorld. Thanks, Kayla, for creating another thrilling story to keep me up at night! 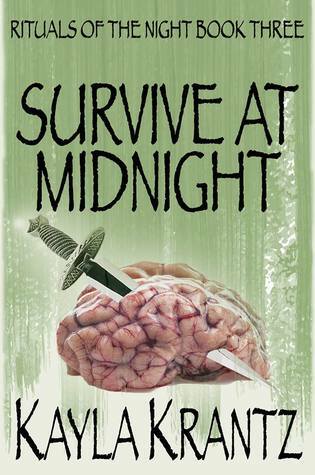 Sign into Goodreads to see if any of your friends have read Survive at Midnight. 27.0% "OMG 😱 Feels like I read more than two percent last night, but Serena did make me stop early and I fell asleep. Starting to get really interesting!"